"Acme’s presence in Morris Plains, NJ- a small suburb immediately outside of Morristown- began in 1953 with the opening of a store on Speedwell Avenue near its intersection with Hanover Avenue. As the building was constructed close to the street, parking was provided by a small lot on the right side of the building and a larger lot behind the building, leading to the possibility of the store having front and back entrances similar to the setup at Acme’s location in Fair Haven, NJ. In fact, it’s entirely possible the stores were very much alike considering them having opened around the same time. "The current Acme in Morris Plains debuted around 1978, having been constructed in what was likely a wooded area behind the original building and its rear parking lot. It was followed by a very brief period of investment in the long-neglected northern NJ market that brought a replacement to the Rockaway store and a new store to Lodi. All three were examples of the company’s new 33M format- a misleading name because most stores weren’t close to 33,000 square feet. Following the opening of the Rockaway and Lodi locations, Acme would wait more than two decades to bring further investment to northern NJ in the form of new stores in Milltown, Randolph and Clifton. "The new Morris Plains Acme likely debuted with a deluxe version of the 70’s Colonial décor package that was still in place in most of the company’s stores. Because of its success, Acme wasn’t hesitant to invest in the location and at some point in the mid-80’s, the store received the 80’s remodel which brought, among other things, a West Coast Video location near the entrance. It’s also possible this remodel saw the fisheye logo replaced with the red oval in the sign frames on the front and Hanover Avenue side of the building. The Rockaway store was also remodeled around the same time, and for the same reason- the two locations along with the long-standing Middlesex store were bright spots in an area where Acme once had a major presence but had started losing its stronghold. Many of the company’s locations were small and outdated when compared to competition from ShopRite and Pathmark and, instead of working to make things better, Acme opted to further neglect them. "The early 90’s brought another upgrade to the Morris Plains Acme in the form of the checkerboard arch décor package. This remodel gave the store a brighter interior and saw the West Coast Video department replaced with a large customer service counter and also created a special aisle for items in bulk sizes- no doubt a humble attempt to keep people in Acme and out of places like Costco and BJ’s. The spread of the checkerboard arch remodel made little sense. The Middlesex store- Acme’s third most successful location in the area- received an even more elaborate version, while the Rockaway store that battled Morris Plains for first place on a weekly basis- was left with the 80’s remodel in place. Even more questionable was the spread of the checkerboard arch remodel to much smaller and less-successful stores in Succasunna, Union and Washington. Subsequent years saw most of the store’s increasingly-troublesome dairy and frozen food cases replaced, starting with the removal of the ancient coffin cases in the last two aisles. "As the turn of the century approached, Acme seemingly struggled with what to do to keep the Morris Plains location successful. Competition in the area was always fierce. The store was bookended by ShopRite stores in the center of Morristown and on the Morris Plains/Parsippany border, and while the former closed in the late 80’s, the antiquated Morris Plains store always maintained a healthy amount of business and had always floated the idea of relocating to a new location- something that was finally realized in fall of 2013, putting ShopRite even closer to the Acme’s doors. Stop & Shop’s nearby location in Cedar Knolls survived and even thrived when the chain pulled out of the area and the store was sold to Foodtown. The company would later return to the area in the late 90’s with an Edwards superstore constructed across the street from ShopRite and close enough to steal some of Acme’s business. A short while later, the Edwards was rebranded a Super Stop & Shop and brought things full circle for Ahold. A small Centennial A&P and Kings in Morristown rounded out the competition. "Acme briefly kicked around the idea of buying the land behind the store that was made available when Tetley closed its plant of many years. Like all rumors of Acme looking into building new stores in northern NJ, nothing came of them. Instead, it was decided the Morris Plains location would receive an extensive remodel, but not before the long-ignored Rockaway store got some attention in the form of the chalkboard market décor package that would attempt to keep it competitive in the face of new competition from ShopRite. Because of this, it was believed that the Morris Plains store would also receive the chalkboard market décor package; however, this was not the case. "Instead, the Morris Plains Acme would receive the Broadway décor package, more commonly referred to as the industrial circus on [Acme Style]. It couldn’t have been more different from what greeted shoppers at the Rockaway location, with dark and mellow tones having been replaced by a festival of colors that wouldn’t look out of place at a carnival, creating one of the most divisive looks for a grocery store. The remodel began with a budget of more than $4 million but was subsequently trimmed by 50%, mostly trimming an extensive exterior remodel that would have featured a tower entrance and stone sign structures by the parking lot entrances on Speedwell and Hanover Avenues. Still, the work was to be extensive as the majority of the interior was to be gutted and replaced, perhaps most impressively while the store remained open to shoppers. A grand aisle would feature a Starbucks department [which has since closed] as well as produce, bakery, seafood and deli- the latter offering hot meal options. The opposite corner of the store called for a pharmacy and customer service department with one hour photo development [which has also closed]. When the months of dust settled and the tarps came down, customers were treated to the equivalent of a brand new store. Only the previous, relatively-new frozen food and dairy cases remained, and even those were refreshed to match everything new that was installed. As Rockaway began suffering at the hands of ShopRite, Morris Plains experienced a slight uptick in business before settling back down to normal levels- perhaps not the desired outcome, but the results could have been worse. "The remodeling of the Rockaway and Morris Plains stores as well as the replacement of the Lincroft store in central NJ led many to believe that Acme was prepping for investment in the northern NJ area. It was rumored that the company even hired a real estate specialist to investigate all available options but rumors of replacements or expansions of locations in Jersey City, Secaucus and East Rutherford (to name a few) never materialized as actual plans. Eventually new stores were constructed in Milltown and the Mount Freedom section of Randolph (a few miles down the road from Morris Plains) and an outdated location in Clifton was replaced with a new one on the other side of town but when further expansion into central NJ with stores in Marlboro and Freehold failed to produce positive results (two of the three stores closed not long after opening), all reasons for optimism were dashed. Acme continued closing the majority of its northern NJ locations and when the once-mighty Rockaway location faded into an oversized convenience store, it was obvious the company lacked any kind of solid plan. The Milltown and Clifton stores lost their pharmacies. Only the stores in Middlesex and Morris Plains remain as relics of brighter days. Are better times on the horizon?" Well, Morris Plains is a very attractive if very small store. It seems to be to be about the same size (maybe a little larger) as the Millburn ShopRite, but in far better condition. You walk into a full-fledged grand aisle, with substantial bakery, deli, and meat/seafood counters for a small store. The entrance is where the wall comes out directly behind the two balloons. The Starbucks would have been directly to the left, next to bakery. Deli comes next to my left here, with meat and seafood behind me. As you can see in this picture, the store was EMPTY when I was here, a Sunday afternoon. Here's a better overview of the whole grand aisle. Looking back towards the seafood counter. ACME's website doesn't list this store as having a seafood department, but it's actually pretty prominent. It could be that it was closed and then re-opened. Another view of the seafood counter. Looking towards the bakery from the front-end. Heading on around the store, meats are along the back wall, with milk in the back left corner, and dairy along the back left aisle. The pharmacy is at the front of that aisle. There is a small Wild Harvest department, with older signage, in the first aisle. That's a pretty pitiful Lancaster Meats sign there! Don't ask me why they didn't use the red block-letter logo here! Deluxe 3-D signs for such a small store. I hadn't seen these category markers before. They look like something from an IGA or a Fine Fare, not an ACME. Frozen foods are in the second to last aisle and half of the last aisle. Pharmacy/HABA in the front corner. Floral is located between the pharmacy and the checkouts. Quick look at the very small front-end before we head out. Outside, I have to ask - is there ever a time when all these carts are in use at this tiny store? I think all those shoppers wouldn't even fit inside! Granted, there weren't many shoppers using carts during my visit. Few thoughts on this one, supermarketfan. I have some answers to questions, and questions for you to answer. 1. Acme uses a generic "ACME" lettering on the refrigerator cases in all their stores. My local location, Doylestown, has around 5 of these. I'm pretty sure the company that they buy them from doesn't have the option to use the real logo. I've seen other stores with this before, too. 2. 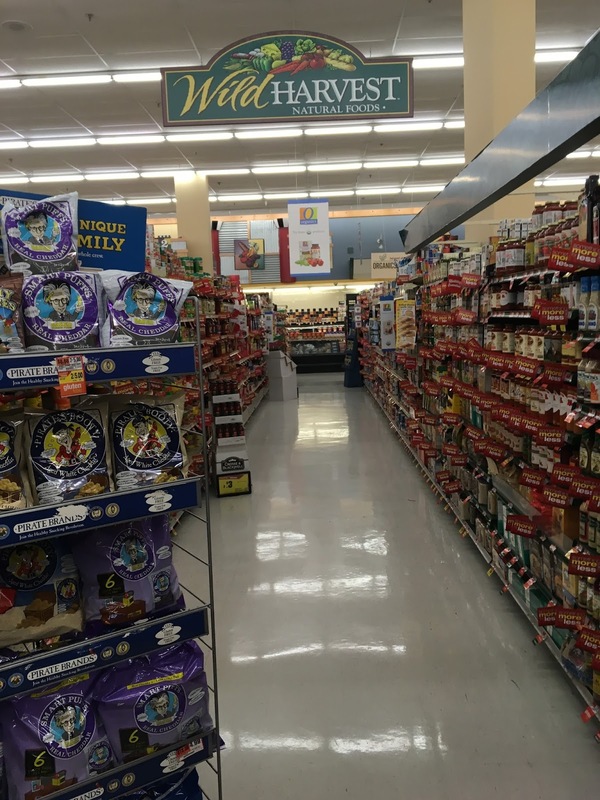 The aisle/category markers you saw are most likely from a SuperValu store. They're most likely a cheap replacement version; the type looks very similar to PF&H. Before the Quality Built remodel at Doylestown, they had some of these in the organic section, if I remember correctly. 3. Why is the interior Acme logo along the front end BLUE? 4. The reason this store probably has so many carts is that practically all Acmes do. My Doylestown location has around twice as much, and actually leak into the Rite Aid down the street. I guess I've never been in a store that has these generic lettering on a case. Many of the stores around here are old enough that they have old cases, or are independent stores which don't bother to spend the money on customizations like that. You're right, the category markers do look like PF&H. And I have no idea about the color of that Acme logo! Hmm, I never noticed the excess of carts at any other Acme. The Elizabeth Pathmark (where Food Bazaar now is) always had too few carts, because they sold a lot of them to make a little extra money and the rest were stolen. Doing large shopping orders there was frustrating for that and so many other reasons! So I appreciate that Acme leans in the other direction. When I went to this store a while ago, I was as baffled as you guys about the blue Acme logo. It was odd when I worked at the store years ago (when the store was remodeled) and it's still weird now. The decor in general was odd, because the graphic panels on the wall fixtures were prone to falling down. They were eventually fixed with actual screws. Hmm, I guess that tends to happen when operations like Acme are doing chainwide renovations, they tend to sacrifice quality.